While Donald Trump has sought to expunge almost every trace of the Obama administration’s legacy from national policy, technological modernization of the government stands out as a great exception. Over five days in June, US officials and the technology world’s most powerful CEOs gathered under the aegis of a new White House division, the Office of American Innovation, for “Technology Week.” Trump’s grand mission? Accelerate former US president Barack Obama’s work. The need for modernization is clear: The US government spends about $89 billion on technology every year, according to the non-partisan Government Accountability Office (GAO). Three-quarters of this goes to keeping its systems running, many of them obsolete. The military still uses floppy disks for critical legacy systems, and the government just stopped reporting progress on the Year 2000 bug this month. That’s starving agencies of money they need to upgrade. 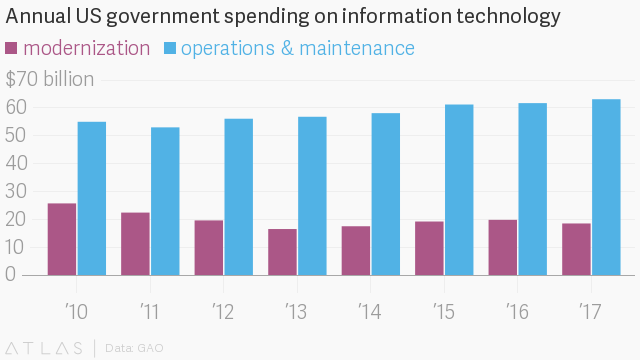 The US federal operating budget for technology has risen to $63 billion, 15% higher than 2010, yet it’s spending about a third less now—roughly $18.5 billion—on modernizing it. Making tech modernization a national priority is an uncharacteristic move for a president who prints out online news articles to read and famously observed after his election that “the whole, you know, age of computer has made it where nobody knows exactly what’s going on.” But under Trump, the drive to rebuild government technology has a clear political lane forward. Notably, it’s often hard to tell Democrat and Republicans apart on this issue. The $2.5 billion Modernizing Government Technology Act, which creates permanent fund to invest in updating IT, has supporters from both parties working to move it to the front of the legislative line. This political armistice even extends, to some degree, to the private sector. Tesla CEO Elon Musk and former Uber CEO Travis Kalanick both quit Trump’s advisory councils—Musk over the president’s decision to withdraw the US from the Paris climate-change accord, and Kalanick mainly over the administration’s immigration and travel bans—but more than a dozen Silicon Valley executives felt comfortable enough this month to attend the American Technology Council’s first meeting, which was devoted to cloud computing, analytics, drones, driverless cars, and 5G wireless networks. Amazon CEO Jeff Bezos, Apple CEO Tim Cook, Microsoft’s Satya Nadella, Eric Schmidt of Alphabet, and other attendees came with motives beyond patriotism or altruism. Their companies stand to reap billions of dollars from government contracts, tax-code reforms for foreign earnings, and other White House prerogatives. Whatever the political risk, they calculated it would be worth it. Trump’s success in revamping IT may come down to rare pragmatism shared by both business and government. Trump, who frequently makes the the dubious claim that government should be run like a business, has a point in this case. Large companies have had to overcome billion-dollar IT fiascos over the last decade to stay competitive. Applying those lessons and the resulting knowledge to government is seen by politicians in both parties as enhancing, not threatening, good governance. Of the 800 government IT reforms recommended by the GAO since 2010, only about 46% had been implemented by the end of 2016. Billions of dollars are being wasted while thousands of data centers await consolidation. Agencies still do not inventory their own mobile devices and software licenses. Software is built in multi-year, multibillion-dollar contracts rather than faster, incremental methods. One development that could change that: an armada of tech teams now seeded throughout the US government bureaucracy has authority to act without special instructions from Congress. But here’s where Trump could fail again. The June gatherings are, at best, just a downpayment on achieving reform. Day to day, everything Trump is attempting on the modernization front is complicated by a lack of experienced professionals running the show and his deep, almost unprecedented unpopularity hindering his ability to recruit more of them. Leadership is needed. Yet most political roles in the federal hierarchy remain empty. Fewer than 10% of political posts at the Pentagon and US State Department have been staffed, for example. The org chart for tech roles, similarly, is still mostly blank. Trump’s technology management, such as it is, is spread impossibly thin. Kushner, whose portfolio also includes Middle East peace, China negotiations, diplomacy with Mexico, and criminal-justice reform, is joined by a small group of players including Liddell, Matt Lira (special assistant to the president for innovation policy and initiatives), Reed Cordish (presidential assistant for intra-governmental and technology initiatives), as well as Obama holdover Haley Van Dyck at the United States Digital Service. Enlarging the leadership ranks may only get harder, even for largely apolitical technology posts. The Washington Post reports senior Republicans are now turning down job offers worried about permanent damage the president may inflict on their reputations. But Trump’s progress on technology reform may come precisely because, after giving his blessing, he isn’t likely to have much direct involvement. His instincts to appoint those with experience at big businesses, and let them run the show, may turn technology into a success story—no matter what else might happen. After a brutal 158 days, the US president has failed to pass much of his agenda. His executive orders have yielded mostly court rebukes and photo-ops, while legislation (with the possible exception of health care) is stalled out. Trump needs a win. Updating government IT could turn out to be it.